Ducati rider Andrea Dovizioso beat Marc Marquez to win the opening round of the 2019 MotoGP season by just 0.023 seconds at the end of a typically frantic affair in Qatar. 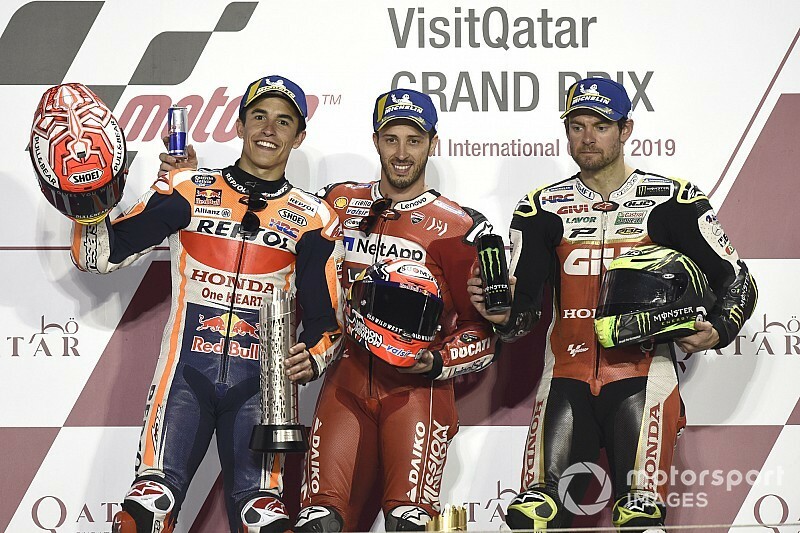 In a repeat of last year's Qatar race, Dovizioso fended off a last-corner lunge from Honda man Marquez for victory, having been at the head of a multi-rider pack for much of the distance. 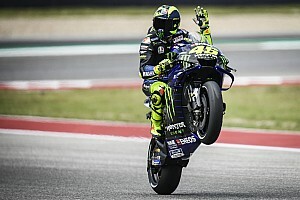 LCR rider Cal Crutchlow made it two Hondas on the podium, overcoming Suzuki rider Alex Rins for third, while Valentino Rossi recovered from 14th on the grid to complete the top five. Rossi's polesitting Yamaha teammate Vinales could manage only seventh, behind the second factory Ducati of Danilo Petrucci. Following the pattern seen in many recent MotoGP races, a 10-rider pack formed at the head of the field early on, as Dovizioso made the best getaway out of the front row starters to take an early lead. The extent to which Dovizioso was moderating his pace was shown by rookie Fabio Quartararo - who had to start from the pitlane after stalling on the grid - lapping over a second quicker than the leaders in the early stages. Rins, moving up from 10th on the grid, made an early attack on Dovizioso on lap five of 22, but was unable to maintain the lead for more than a lap, with the pair swapping the lead multiple times in the opening half of the race. Dovizioso regained the advantage for good on lap 11, with Marquez replacing Rins as the Ducati rider's main challenger when the Suzuki rider ran wide and dropped fo fourth. Rins mounted a fresh offensive to re-pass Petrucci and Marquez to move back into second on lap 15, but on lap 20 he made another mistake, outbraking himself at Turn 1. That left the fight for victory to be decided between Dovizioso and Marquez, and the latter passed his adversary at the Turn 4/5 double right-hander on the penultimate lap to lead. But Dovizioso was able to retake the lead at Turn 1 at the start of the final lap, and rebuffed a subsequent attack from the reigning champion at Turn 10. Marquez made one final attempt at wresting back the lead at the last corner, but was unable to block Dovizioso's line and was outdragged by the Italian to the finish line the tune of 0.023s. Crutchlow, gifted third by Rins' lap 20 mistake, held on for the final place on the podium by a tenth ahead of the Spaniard. Rossi was able to tag on the back of the lead group in the early stages, and as the race entered its latter stages the seven-time premier class champion slowly progressed up the order. He dispatched teammate Vinales on lap 16, picked off Suzuki rider Joan Mir next time around and on lap 20 he moved up to fifth at Petrucci's expense. Petrucci hung on for sixth, having opted for soft tyres front and rear (the top five all used mediums), followed by Vinales, who dropped from first to seventh on the opening lap and never really recovered. Mir was the best of the rookies in eighth, only dropping away from the leaders in the closing laps, while Takaaki Nakagami (LCR) and Aleix Espargaro (Aprilia) completed the top 10. Franco Morbidelli, who ran ahead of Rossi early on, slumped to 11th in the final reckoning in the first race outing for the new Petronas SRT squad, ahead of lead KTM man Pol Espargaro. Jorge Lorenzo picked up three points for 13th on his Honda race debut, followed by Andrea Iannone (Aprilia) and Johann Zarco (KTM). Quartararo (Petronas SRT) finished just outside the points in 16th. Only three riders failed to finish a relatively incident-free race, with Pramac Ducati pair Francesco Bagnaia and Jack Miller both dropping out. Miller's GP19 shed its seat unit on the second lap, but the Australian persisted for another 10 or so laps before finally fading and pulling into the pits to retire. Aprilia wildcard Bradley Smith was the one and only crasher of the race.